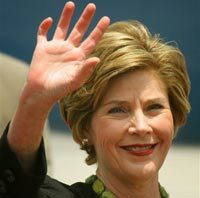 U.S. first lady Laura Bush will tour an AIDS treatment center and launch an anti-malaria campaign in Zambia on Thursday as she highlights U.S.-funded efforts to combat disease in the southern African nation. Mrs. Bush began a tightly orchestrated day with a brief courtesy call to Zambian President Levy Mwanawasa and first lady Maureen Mwanawasa. She will visit Regiment School in Lusaka to watch students perform a skit about HIV/AIDS, meet with scholarship students and give the school a merry-go-round that doubles as a water pump. The PlayPump device has been championed by Mrs. Bush as part of a public-private partnership with the Washington-based Case Foundation. She will also sit down to a traditional Zambian lunch of nshima, the local cornmeal-based porridge that is the staple of most Zambians' diets. Accompanied by her daughter Jenna, Mrs. Bush arrived in Zambia late Wednesday after a daylong visit to Mozambique, where she announced a new US$507 million (euro377 million) package of aid aimed at curbing malaria and building roads. She will travel Friday to Mali, the last stop in a tour of African countries that have benefited from U.S. AIDS funding. About 16 percent of adults are HIV-positive in this politically stable, copper-rich but largely impoverished country of 11.5 million just north of Zimbabwe, and Zambia has been a major recipient of American HIV/AIDS funding. The country received US$149 million (euro109 million) in funding through the President's Emergency Fund for AIDS Relief (PEPFAR) in fiscal 2006 and will receive almost US$200 million (euro149 million) in fiscal 2007. Funding is expected to rise in 2008. Last month, U.S. President George W. Bush called on Congress to authorize an additional US$30 billion (euro22.3 billion) to fight AIDS in Africa, a figure that would double the U.S. commitment to the continent. The current program, which provided US$15 billion (euro11 billion) over five years, expires in September 2008. Mrs. Bush will be accompanied by Melinda Doolitte, a finalist on television's "American Idol." The American first lady has also used her trip to support the role of faith-based organizations in foreign aid efforts, a role that local health practitioners say is important but only part of a larger strategy. She will visit two such efforts in Zambia, where the vast majority of people are churchgoing Christians. Faith-based aid groups like World Vision and Catholic Relief Services are partnering with local Zambian groups to distribute 500,000 insecticide-treated bed nets throughout Zambia in a US$2.5 million (Ђ1.8 million) anti-malaria public-private partnership. Half of the money for the project is coming from a coalition of American corporations. Mrs. Bush will also visit Chreso Ministries, a faith-based organization in Lusaka that provides HIV/AIDS treatment, counseling and testing services. Some observers, like former Health Minister Nkandu Luo, say that U.S. and Zambian efforts need to focus more on prevention. "Prevention has been overshadowed by treatment," said Luo, who now does HIV prevention work with Zambian women.